(Culver City, CA – March 19, 2015) – Selected from the Wende Museum’s vast collection of more than 1,200 pieces, Communism for Dinner tells the story of the GDR through the lens of its commemorative plates. Countries use different means to define themselves politically, socially, and culturally. Monuments and street names constitute the canon of collective memory: by highlighting specific persons and events from national history, they project an idealized and often romanticized image of the past onto the present. By suggesting a direct link between past and present, they aim to strengthen a social bond. East German commemorative plates fulfilled a comparable function. Produced in large numbers by more than a dozen different companies, they were presented as gifts for individuals and organizations to honor their contribution to the construction of socialist society. These decorative plates carried a political iconography: viewed together, they offer an intriguing self-image of the East German state and its ideology throughout the four decades of its existence. 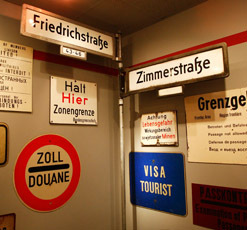 The exhibition is organized around significant categories: Socialist Heroes; Historical Events; Political Organizations; War and Peace; Sports, Consumption and Leisure; Agriculture; Industry; Transport and Travel; and Topography. All these categories contributed to a sense of identity and belonging. They represent a society congratulating itself on its accomplishments. As so often, material culture invites us to look through the chinks between ideology and practice. Some plates betray the absurdities of an all-encompassing ideology or the ironic wink of a plate artist. What to think of a plate celebrating the victory over fascism and an East German victory in a European handball competition? What about a plate dedicated to a hiking society that protests the A-bomb and features Roosevelt, Churchill, Mussolini, Hitler and Stalin? What do we make of a plate that simultaneously honors female workers and chicken breeding? The exhibition, organized by Chief Curator Dr. Joes Segal, presents a fascinating world that waits to be discovered and will be on view through May 31, 2015. Justin Jampol, Founder/Executive Director, The Wende Museum, 310-216-1600 x302, jjampol@wendemuseum.org.